According to industry sources, Apple has signed a deal with chip manufacturer TSMC and its IC design service partner Global UniChip. The three year pact covers the next Ax processors produced using 20nm, 16nm and 10nm processes. TSMC will start by producing the A8 processor in small quantities in July with large quantities coming off the 20nm line after December. In the first quarter of 2014, TSMC will install new 20nm equipment that will be able to process 50,000 wafers. The A8 is expected in a new Apple iPhone model to come to market early next year. Some of that added capacity, 20,000 wafers, will be converted to 16nm technology with the A9 and A9X processor being built for Apple during the third quarter of 2014. It is not known whether Apple will be using another silicon slinger to supply these chips. TSMC's 12 inch fab in Southern Taiwan will be where the chips for Apple will be produced. Capacity will start at 10,000-12,000 12 inch wafers and will pick up as the new year begins. 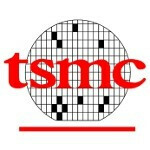 Apple has been rumored to have made a deal with TSMC many times before. The Cupertino based tech giant is trying to divorce itself from Samsung as its Korean rival has been responsible for most of the Ax chips found in devices like the Apple iPhone and Apple iPad. You can't. For every Apple chip Samsung loses out on they sell two with their ever growing market share. "TSMC will start by producing the A8 processor in small quantities in July" Does that mean there will be no A7 and A7X? I think Samsung is still under contract to make the A7/ A7x chips for this year. The A8 chip will be made by TSMC and will go into mass production in Q1 of next year.